Akie is a Brooklyn native raised in a musical household full of jazz and politics fueled by his former-activist mom and dad. His raucous, guttural and soulful vocals are a delectable fusion of Donny Hathaway and Tom Waits. 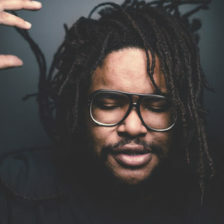 He’s equally adept singing neo-soul, funk, contemporary jazz, alternative rock, and hip-hop. Over the past half a dozen years, he has become a visible contributor to the fertile Brooklyn music scene as a musician, songwriter or featured vocalist with a collective of upstart groups such as FutureSoul band Aabaraki, the Screaming Headless Torsos, Miri Ben-Ari (the “Hip-Hop Violinist”) and rap sensation Soul Khan. He also birthed the Akie Bermiss Trio, independently released his first self-titled solo EP (via Rockwood Records in 2014) and he continues to mine a loyal fan base by performing frequently at cutting-edge venues like Rockwood Music Hall, The Falcon, BAMcafé, The Apollo Cafe, and more. To his friends, he is considered a musical snob of the highest order; to his enemies, a musical charlatan of the basest variety. Among other things he is also the author of a children’s book (“I Hate to Be Sick,” out on Scholastic), a lover of science fiction and fantasy novels, a huge fan of cigars, and he takes his bourbon: neat. re/CREATE celebrates musicians paying homage to the traditions they love while creating music from the heart. In this episode, we feature singer-songwriter Akie Bermiss taking on the music of Joni Mitchell.